It's unfortunate a show like CONSTANTINE wasn't able to air an appropriately Halloween-y episode for 31 October, but no matter. This was a solid enough follow-up to the flashy-but-hollow pilot, that had to introduce a new female lead in psychic Zed Martin (Angélica Celaya) as replacement for psychic Liv Aberdine. I'm not sure how I feel about Zed right now; she was considerably less feisty than expected (just more forthright than Liv), and lacked her comic-book namesake's background (a former Christian cult member and ex-lover of Constantine). In this television adaptation, Zed's just a straightforward rethink of Liv Aberdine with a slightly different paranormal talent. Why bother adding her? This week's story involved Constantine (Matt Ryan) travelling to a small mining town in Pennsylvania, where a miner was burnt to a crisp while taking a shower that mysteriously began spouting flames. A little dig at the urban myth that frakking is responsible for flammable water? I hope so, as a memorable aspect of the Hellblazer comics, for me, was how they'd use supernatural elements to comment on social, economic and political concerns. I also appreciated the little connection to Constantine's homeland, as the mining town's history was linked to Wales (where Matt Ryan was born, trivia-hounds). 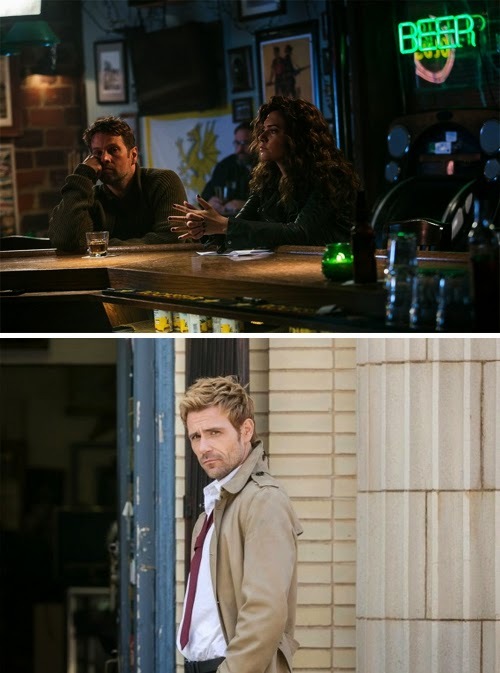 The mystery with the mining town's deaths (linked to spirits living beneath the surface) was perfunctory and difficult to really care about, but I'm not even watching Constantine for the stories. It sounds weird to say that, but there are just so many TV shows like this that Constantine faces an uphill struggle on that front. I would undoubtedly be more gripped by what a cable version of this show could do, given less restraints, because a lot of this just felt like reheated Supernatural. But at least the budget ensures some movie-standard effects, with the Welsh spirits looking very impressive once they appeared—and the sequence with the bizarrely flooding car full of demon hands was cool. 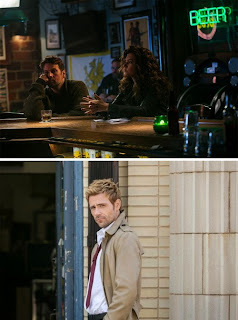 There's been fanboy disappointment over the fact a mainstream U.S network version of John Constantine can't be seen smoking, so I appreciated the creativity of scenes where Matt Ryan was glimpsed having just smoked a cigarette, or about to spark up, but nothing had really been shown outright.